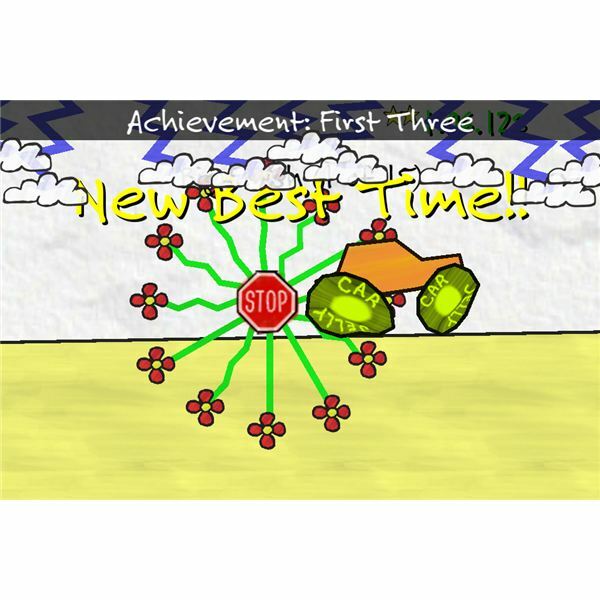 JellyCar 3 puts you in control of a JellyCar as you drive it along a side-scrolling plain with several obstacles that will prevent you from reaching the level goal. It's not a pure driving game because there are also some elements of platforming and puzzle games here. 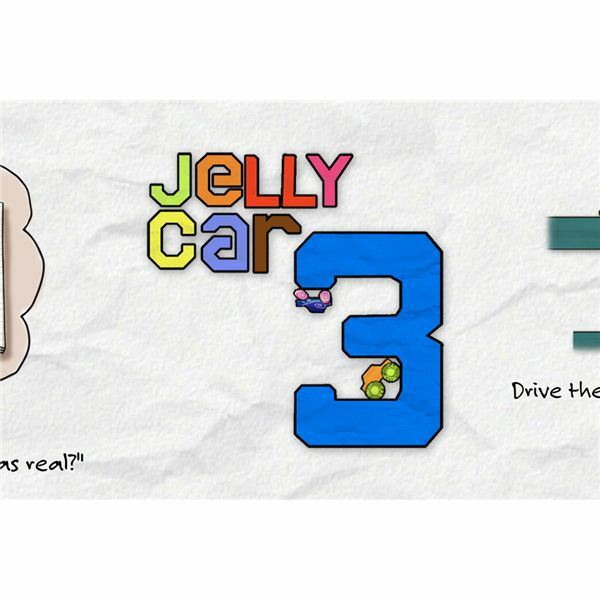 Your goal is to drive the JellyCar to a specified point before you can proceed to the succeeding levels. However, it's not smooth driving all the way, as you will be encountering various traps, entanglements, obstacles and other things that will hinder you from reaching the end of the level as fast as you could. One nice feature of this game is that while you can't do many things to the JellyCar, aside from moving it forward or backward or flipping it, the execution of this gameplay is simply flawless. The game environment is bouncy and soft, just like your JellyCar. And the car's reaction to the bumps and other road impediments is also well carried out. You can really feel the lightness of your vehicle. In other words, the game physics are truly commendable. The game graphics are also highly commendable. 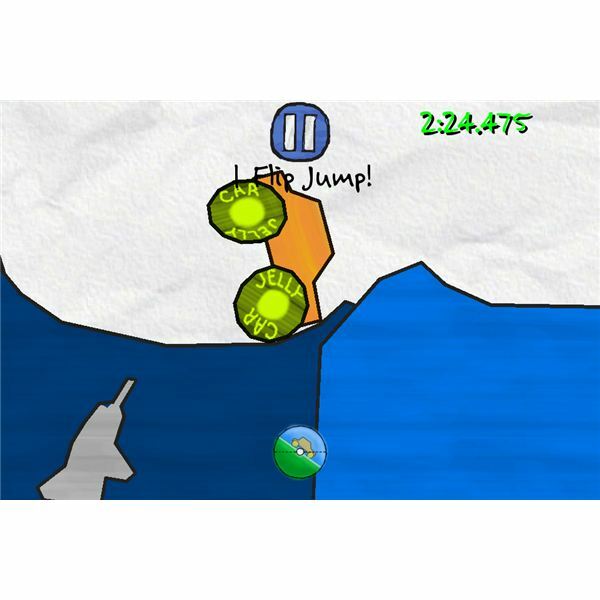 The game supports the retina display of the iPhone 4, so even if the game's overall appearance is too simple, you can still appreciate the graphical characteristics of this title. When it comes to control, the game doesn't really offer much. You can only do three things to your JellyCar – drive it forward or backward and flip it upside down. You can do this by tilting your iPhone in your desired direction. Why would you would want to flip the JellyCar? You'll find out once you play this game.You can also tap on it to make it bigger. Again, this is a very important control that you must know when to use and when not to use. The game gives you 50 interactive levels in all. Why interactive? Simply because most of what you see in the levels moves. Every level will require you to get as many as three stars by finishing the level as efficiently as you can. There is also a secret in every level which you can use to finish the game quickly. Other nice features of the game include – powerups that you can use to your advantage at the right time and on the right level. Some of these powerups may be hard to collect so pay attention to every detail in each of the levels. The other features of the game can be easily found if you go to the game's main menu. In fact, the game's main menu is a horizontally scrolling list of menus and options that you can tap any time you want to. From the main menu you can change the appearance of your JellyCar, select level packs and "learner's permit," my stuff, my cars, achievements, my profile and my sounds. You can also read the latest gaming news about JellyCar, as well as find the game leaderboards. Easily, we can declare this iPhone game as a must have. The looks and appearance of the game may seem pretty juvenile or simplistic, but we can assure you of this – it's a pretty entertaining and fun game to play on your iPhone. The number of hours that it will take you to finish the game from start to finish makes the game worthy of its price tag of $0.99.